(Editor’s note: THE HOLIDAYS ARE COMING!!! And Carrie Brown’s got you covered. People tend to discount Floridians as Southerners. I suppose the blissful images of glistening beaches, swaying palm trees, and bright pink flamingos, as well as the knowledge that we’re basically the retirement capital of the known universe all tend to distance the state from cultural Southern-ness in many people’s minds. Nevertheless, a good portion of Florida is still The South and a good number of Southern customs are still retained throughout the state. I am very Southern, and so my tastes tend toward good, old-fashioned country cooking. Growing up in northeast Florida- about an hour away from the Florida-Georgia state line- disposed me to favor some common Georgia crops, thus my favorite nuts are two of the “Three P’s” that are staples from our northern neighbors: peanuts and pecans (the third P being peaches, for those not in the know). There is nothing quite like some fresh, super salty, hot boiled peanuts, or a handful of buttery pecans. And my absolute favorite of all holiday foods is the caramel-flavored beauty queen of desserts, otherwise known as pecan pie. 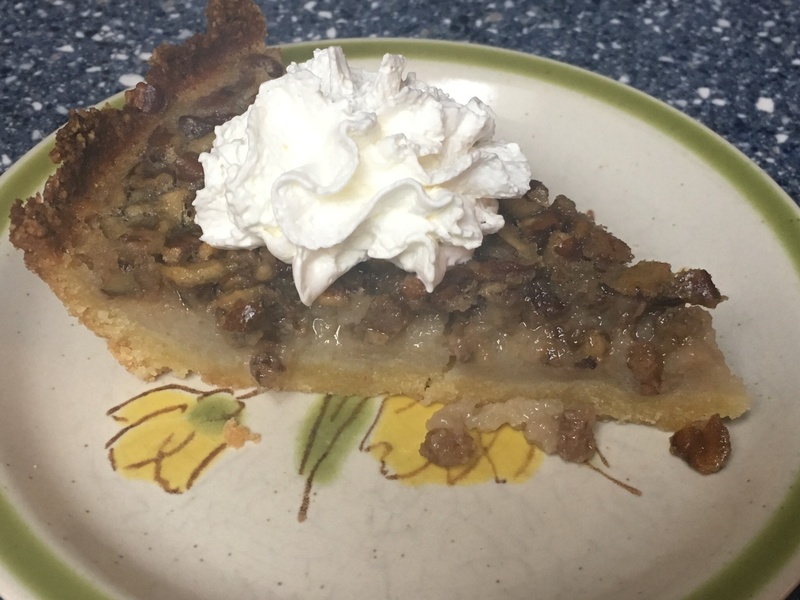 The best pecan pie I’ve ever had is the one my mother always made, and it’s a recipe passed to her from my Mema (and probably passed on to her as well). Like most family heirloom recipes, it’s a little unique. Instead of the deep, dark, and so-sweet-your-teeth-ache filling you find in most commercial pies, my Mema’s pie recipe is made with light corn syrup and eggs, and so it’s got a much lighter taste and feel to it. In essence, it’s not as heavy and is much more delicate in flavor. Well, obviously Mema’s recipe is out. Since I’ve been keto, I have tried many “friendly” pecan pie recipes, and pretty much all of them were a fail. Don’t get me wrong, many of them tasted good, they just weren’t MY favorite pecan pie. They were all too dark, too rich, and sickeningly sweet. None of them managed that delicate balance of sweet and light and caramel and buttery pecan goodness. I’d pretty much given up on finding a good substitute and resigned myself to not bothering with the pecan pie anymore. 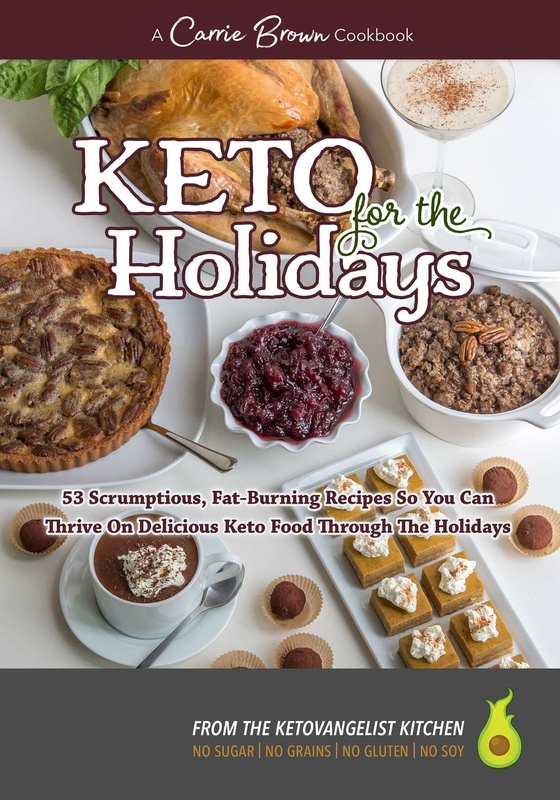 And then I got my copy of Carrie Brown’s holiday cookbook: Keto for the Holidays. As I browsed the table of contents, I have to admit my eye just kind of skimmed over and dismissed the pecan pie entry, because no one gets it right and so why bother, eh? But I noticed as I was flipping through the book proper that the picture of her pie actually looked right. The filling was light and golden instead of dark and deep brown. Aside from omitting the actual sugar/corn syrup and using friendly sweeteners in its stead, the rest of the recipe looked surprisingly similar. Hmmm, I thought. Maybe she’s done it. Now that the holidays are coming up, it would be a good time to test it out and see just how close she got to my Mema’s pie. And so, I did. This is the point where everyone expects me to say that it was identical to my Mema’s recipe and is the best thing ever. But I’m not going to say that at all. This pecan pie was, indeed, quite delightful and it did manage to hit all those same notes: sweet, light, caramel, and buttery pecan. 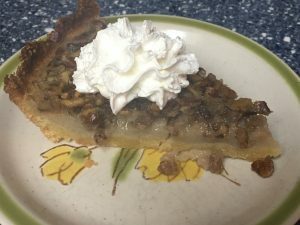 It wasn’t exactly how I remember Mema’s recipe tasting because, to be perfectly honest here, I’ve been keto so long I genuinely don’t really remember what that pie tasted like. When that little tidbit occurred to me- that I’d built up this idea of a perfect pie in my head and at the same time I couldn’t even remember how it tasted- well, I felt pretty silly. However, I can say that Carrie’s pie was darned close to the ideal I’d created in my head. I think what was most surprising is that, through some clever browning here and extract usage there, Carrie managed to recreate a very real caramel taste that is a staple of even the lightest of pecan pies. 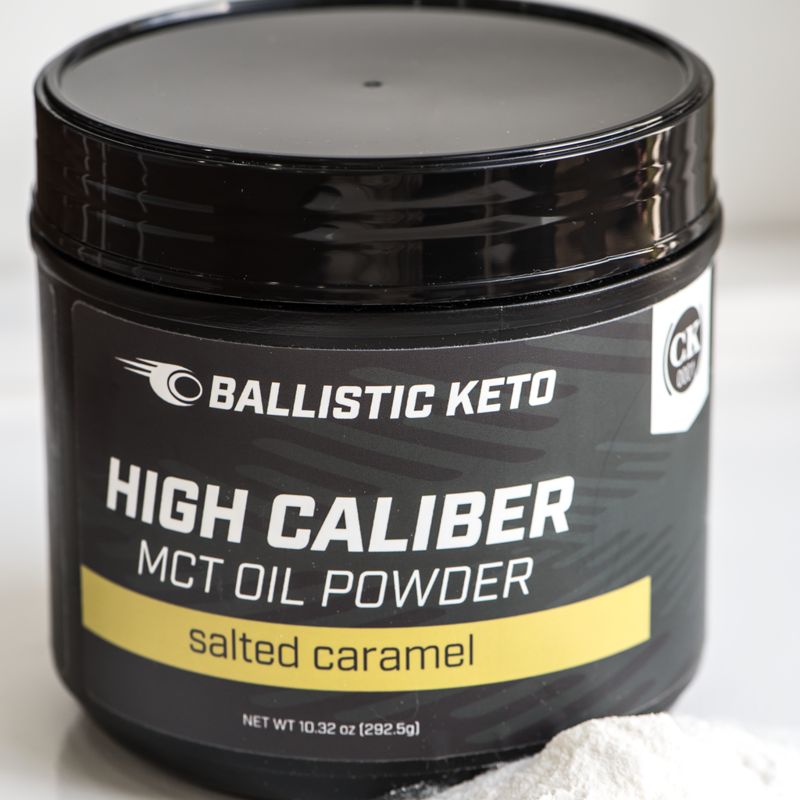 Caramel is an incredibly difficult flavor to replicate with keto-friendly ingredients, as no keto sweeteners caramelize quite like real sugar does, and so capturing that same flavor profile is a pretty major feat. The other impressive part of this dish is that it has the same mouthfeel as authentic, sugared pecan pie. There is a kind of gelled gooey-ness that is peculiar to this dish, and Carrie flat-out nails it here. The best part, in my opinion, is that my family liked it. 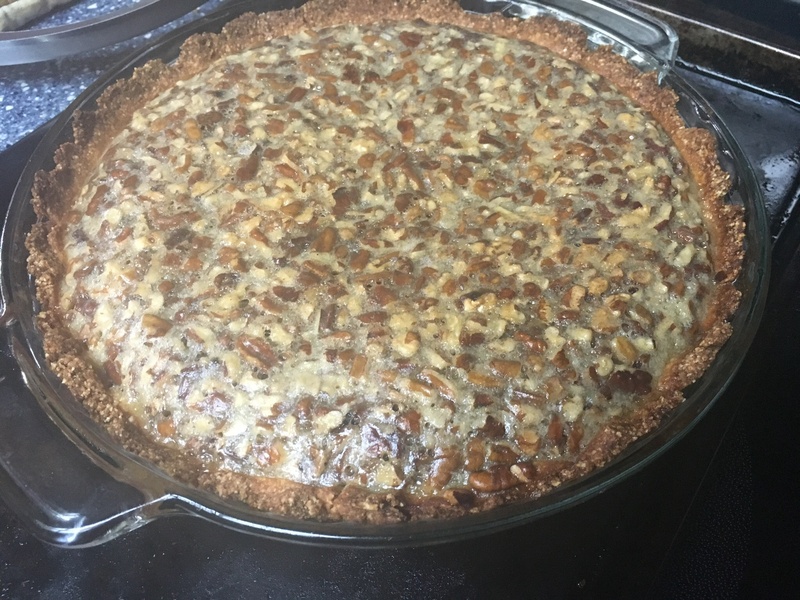 In fact, in my pre-keto days I would make a pecan pie and pretty much eat it by myself, as my husband was not a fan. This pie, however, was finished off by hubby (for breakfast!!! ), which was pretty surprising to me. This pecan pie was such a success in my house that it will definitely be gracing my table come Thanksgiving (and probably Christmas, too!). And it did for me what those classic holiday comfort foods so often do; brought back to me some good times from days long past, and so I consider it a great success. 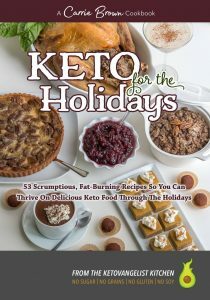 You can score your own copy of Carrie Brown’s Keto for the Holidays cookbook at The Ketovangelist Kitchen. Be sure to check out Carrie’s other recipes and cookbooks while you’re there.